The medieval monster is a slippery construct, and its referents include a range of religious, racial, and corporeal aberrations. 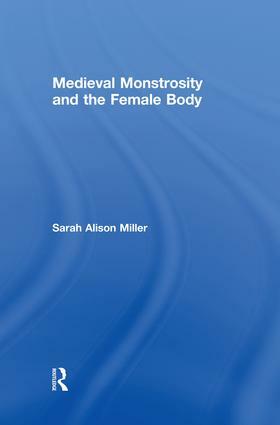 In this study, Miller argues that one incarnation of monstrosity in the Middle Ages—the female body—exists in special relation to medieval teratology insofar as it resists the customary marginalization that defined most other monstrous groups in the Middle Ages. Though medieval maps located the monstrous races on the distant margins of the civilized world, the monstrous female body took the form of mother, sister, wife, and daughter. It was, therefore, pervasive, proximate, and necessary on social, sexual, and reproductive grounds. Miller considers several significant texts representing authoritative discourses on female monstrosity in the Middle Ages: the Pseudo-Ovidian poem, De vetula (The Old Woman); a treatise on human generation erroneously attributed to Albert the Great, De secretis mulierum (On the Secrets of Women), and Julian of Norwich’s Showings. Through comparative analysis, Miller grapples with the monster’s semantic flexibility while simultaneously working towards a composite image of late-medieval female monstrosity whose features are stable enough to define. Whether this body is discursively constructed as an Ovidian body, a medicalized body, or a mystical body, its corporeal boundaries fail to form properly: it is a body out of bounds. "This is a fine, stimulating book which constructs a subtle, complex argument not only about monsters, but the theorizing of men and women in the thirteenth and fourtteenth centuries." "Makes a significant contribution to our understanding of the complex workings of medieval teratological discourse, its constructive and deconstructive capacities, and its role within the formation of medieval socioreligious material and textual identities." Sarah Alison Miller is as assistant professor of Classics at Duquesne University.